Emily Hanson, co-founder of Shared Ground Farmers’ Coop, which brings together farmers from diverse backgrounds to help them achieve economic viability and increase the supply of healthy, local food to communities in the Twin Cities area of Minnesota. Photo Courtesy of Emily Hanson. Straddling the rural urban divide, Shared Ground Farmers’ Coop in the Twin Cities area of Minnesota seeks to unite minority and immigrant farmers and help them gain access to local food markets, achieve economic viability, and enhance leadership skills all while emphasizing sustainable farming. Seedstock first spoke to Emily Hanson in 2013 when she and her husband were transforming vacant urban lots into green space as part of Stone’s Throw Urban Farm. “Over the three years I was there, we grew from three vacant lots to 16, from 17 CSA members to about 100,” says Hanson. (Stone’s Throw is a founding member of the Shared Ground Coop). The idea for the coop began to take shape when Hanson and her husband Klaus Zimmerman-Mayo connected with the Latino Economic Development Center (LEDC), who had been doing cooperative business management training with several groups of Latino farmers around the region. Hanson’s husband Zimmerman-Mayo wrote up the incorporation articles for the coop in the winter of 2013-2014, and the farmers immediately set to work. The founding farms, Agua Gorda Coop, Cala Farm, La Familia, Stone’s Throw Urban Farm and Whetstone Farm collectively offer their customers sustainably produced meat and vegetables. 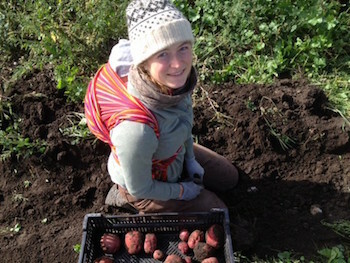 The Shared Ground Farmers’ Coop sells to 150 families through its CSA program and to 30 local restaurants and wholesalers as well as through the Minneapolis Farm to School Program. The Shared Ground Coop has helped to improve access to local food markets for immigrant and minority farmers, fulfilling its mission of using food and farming to fight for social justice.